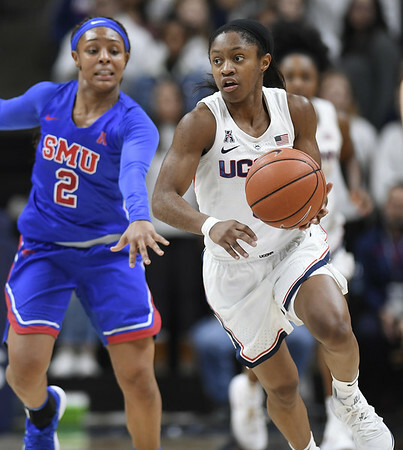 HARTFORD - Crystal Dangerfield had a career high 26 points, nine assists, and no turnovers in the UConn women’s basketball team’s win at Temple on Jan. 19. According to her coach, the junior point guard topped herself on Sunday. Dangerfield finished with 17 points, nine assists, and no turnovers in 35 minutes as the third-ranked Huskies routed Central Florida 93-57 in a showdown for first place in the American Athletic Conference at the XL Center. Dangerfield’s first assists set up hoops by Christyn Williams and Megan Walker as the Huskies took an 8-0 lead in the opening 85 seconds. She had eight assists in the first half as UConn took a 25-point lead. But not only did Dangerfield get the offense moving, she stopped UCF leading scorer Kay Kay Wright at the defensive end. Wright managed just eight points, 10 below her average, on 4-for-15 shooting. Dangerfield maintained her lead in the AAC in assists (5.7) and assist-to-turnover ratio (3.1). In her last six games covering 196 minutes, she has 44 assists and just five turnovers. “She’s so good at seeing us and getting us the ball right where we want it,” UConn’s Napheesa Collier said. And Dangerfield is where she wants to be physically and mentally. “Crystal had to find herself, kind of like Megan is doing right now,” Auriemma said. “Crystal came and was pretty good. Then she didn’t understand what really, really good was and what it took to get there and every little thing set her back. Collier and Katie Lou Samuelson became the second pair of four-year classmates to combine for 4,000 career points. The seniors needed six points to reach the plateau Sunday and Collier took care of all six in 1:48. Samuelson became the 10th UConn player to reach 2,000 on Jan. 13 against South Florida and her 15 points Sunday puts her career total at 2,069. Collier is on track to be the 11th member of the 2,000-point club and her 23 points Sunday puts her career total at 1,963. The duo’s 4,032 points is second behind Class of 2016 stars Breanna Stewart (2,676) and Moriah Jefferson (1,532), who combined for 4,208 points. Tuck had 1,298 points to make the four-time champions’ total 5,506. With 1.7 seconds to go in the first half Sunday, Dangerfield prepared to inbound the ball underneath the Huskies’ basket. Dangerfield lobbed a pass to Samuelson, who was able to tap the ball with her left hand back to Dangerfield, who beat the UCF defense and the clock with a layup. It certainly did not come out of UConn’s playbook. Collier finished with nine rebounds to move her career total to 998. … Attendance at the XL Center was 12,139, a season high … UConn freshman Olivia Nelson-Ododa and UCF sophomore Masseny Kaba were called for a double-foul 23 seconds into the second quarter after Nelson-Ododa blocked a shot by Diamond Battles’ and got tangled up with Kaba on the floor. Posted in Newington Town Crier, UConn on Monday, 28 January 2019 21:17. Updated: Monday, 28 January 2019 21:19.